Coming straight to the point, Ishqiya is a gripping movie that entertains, excites and keeps you engaged till the very end. The cast doesn't boast of superstars but the story of small-time thugs Naseeruddin Shah and Arshad Warsi falling for the serene-yet-coquettish young 'widow' Vidya Balan whose gangster husband has died, is not a run of the mill Bollywood potboiler. Still, it has all the ingredients that are needed to sizzle and surprise you. Set in the heartland, Ishqiya goes out of the morality mode that was typical of Indian movies. Iftikhar alias Khalu Jan [Naseer] and Babban [Arshad] share a wonderful chemistry and as they run from the menacing Mushtaq Bhai, who was intent on burying them into the qabr alive, the Bhopali duo reach Cowbelt. They land in rural Gorakhpur, a place where kids get to know how to use Tamancha [revolver] even before they can wipe their posteriors. Khalu Jan falls in love with Vidya Balan alias Krishna Ji, the mysterious 'widow' who smooches just as passionately as she fires with the gun. There are funny dialogues, the unique accent of Bhopali Urdu along with Purabi dialect of Hindi prevalent in Eastern UP, and the duo's Jai-Veeru kind of relationship. Krishna hatches a plan to abduct an industrialist and though the initially reluctant duo agree to it, as they have to return Rs 25 lakh to Mushtaq Bhai to save themselves. More surprises are in store as the storyline takes you through rural Uttar Pradesh. A young boy joins Sena [army] but it is revealed later that it's not Indian army rather they are caste armies, backwards fighting thakurs et al. And there are red flags aflutter in a Maoist village. Babban and Khalu Jan are no less surprised as the former says, 'Back at home we have only Shia-Sunni, but here there are Pandeys, Yadav, Jat, Thakurs...and everyone having their armies'. Gulzar's lyrics are once again refreshing with good cinematograhy turning it into a nice spectacle. Having succeeded in their plan, Babban and Khalu Jan along with Krishna Ji are back. Each with their own ideas for future. There is another twist in story of love and betrayal with the return of the 'dead husband' who had assumed another identity and had played a deceitful game for his wife, brings more action. Jilted lovers, Khalu Jan and Babban are on their way back from this Gorakhpur village. But both of them are still haunted by memory of the strange seductress. They return to her. What happens after that? Who will she go with? No judgment on morality. This is another track. [Ibn-e-Batuta was the famous traveller, historian who often had to run away without wearing the footwear] The other song, 'Dil to bachcha hai...' has also become popular. Certified adult, this film is thoroughly enjoyable and it's advisable to watch it in theatre than on VCD. 'Thakur' Amar Singh for Rajput resurgence in Indian Politics! The decline in influence of Thakur leaders in Indian politics has been a cause of concern among the once-dominant Rajput community. And Amar Singh's visible haste in moving away from Samajwadi Party and Mulayam Singh, is an indication that the suave-socialite now wants to play the pivotal role for Rajput resurgence. He is already one of the most prominent faces of the community in the country. The fact that major North Indian states where Thakurs earlier used to hold political clout, have undergone a sea change in post-mandal politics, and there is a void in the leadership of the Rajputs seems to have stirred Amar. It's difficult to predict whether he will succeed. However, Amar Singh seems to have taken the plunge and has burnt his boats. He may not be a leader of grassroots but has certain qualities, to which we will come later in this blog post. In fact, Thakurs got more than their share of blame. But never in the past Thakurs seemed so concerned about the lack of tall Thakur leaders in the country. And it is indeed ironical that the tallest Thakur leader VP Singh became instrumental in changing the Indian political scenerio. Singh, during his brief term as Prime Minister, implemented the Mandal report, which changed the complexion of Indian polity. Thakurs, who aren't numerically a strong force, lost the political space. Backwards like Yadavs and Kurmis, Dalits, Tribal and other OBCs who were much more numerous soon took over. Chandra Shekhar became Prime Minister for four months. Arjun Singh was one of the strongest Thakur leaders and came close to becoming Prime Minister. The days of Vir Bahadur Singh, who was Chief Minister of UP, and Digvijay Singh ruling Madhya Pradesh [or Virbhadra Singh in Himachal Pradesh] are gone. Of course, Raman Singh is at the helm in Chhattisgarh but his influence is limited. Madhya Pradesh chief minister Shivraj Singh Chouhan is not a Thakur but belogs to the Kirar caste, an OBC community. The number of Rajput MLAs and MPs has gone down significantly in the last two decades across the country. Thakur stalwarts like Bhairon Singh Shekhawat and Arjun Singh have been either shunned or sidelined in their respective parties. Jaswant Singh and Rajnath are also gone from the scene. Do we even hear of Karan Singh these days? It is in this context that the need for Thakurs to play a part in politics is being felt dearly. It is quite clear that Kshatriya organisations at district and town levels are giving such feelers that they would back Amar Singh wholeheartedly. After all, it is not possible for a Thakur in dynasty-ruled Congress to play a major role. Amar Singh, with his manoeuvres, connections and other qualities, can either head a political party supported by Thakurs or lead a loose group of Thakur MPs. If one does focus on his statement published in a post on his blog, then it's crystal clear that Singh aims at forging an alliance of Extremely Backward Castes (EBCs) or Most Backward Castes (MBCs) who abhor the OBC dominance. Yes, SP rule was perceived as Yadav raj and BSP rule appears Dalit monarcy. But can he get the necessary support. Amar Singh now says that he would dedicate himself to Kshatriyas and Nishads, Rajbhars, Nonia, Vishwakarma, Pal, Teli and caste groups like Kashyap, Kumhar et al. It may appear a fantasy but there are signs that his community members want him to play a pan-Indian role. Given the strong sense of clanship among Thakurs, even if they belong to diverse political spectrum, this is a possibility. Brahmins had also suffered electorally after Mandal commission report but because they are a strong caste group, numbering around 9% in UP and 5-8% in other North Indian states, their alignment can benefit any coalition and thus they are again being wooed. Singh has some strengths. Apart from the ability to recall and recite couplet for any occasion, he even otherwise has a way with words and knows how to stay in news. Sections of Muslims praise him as he was the only man who spoke courageously after the Batla House encounter and visited Jamia Nagar, at a time, when no Muslim leader was visible on the streets. It is a fact that he stands by his friends and has certain characteristics which endear him to others. Otherwise there are many more cash-rich and connected persons in this country but none of them can boast of dedicated friendships of the likes of Anil Ambani, Amitabh Bachchan, Jaya Prada and Sanjay Dutt among others. Especially in the class of celebrities where people have huge egos and nobody bothers much for the other, he goes the extra mile and takes care of his friends, which attracts them towards Singh. Samajwadi Party leaders and workers seem happy that Singh is gone. But the SP has a tough battle ahead. For Amar Singh. He is testing waters and is touring UP, gauging the support of his community and other groups before taking a decision. It may not change the shape of Indian politics but Thakurs are poised to support him in his move. We've just heard of Kshatriya Chetna Jagran Rath Yatra. Many more might follow soon. UP has seen Jat leader Chaudhary Charan Singh's successful AJGAR [Ahit, Jat, Gujar and Rajput] & Mulayam Singh's MY [Muslim-Yadav] formulae in the past. Will Amar's caste calculations work? Let's wait and watch this interesting man. I had no great expectations when I entered the cinema hall to watch Salman Khan-starrer Veer, as most of the reviews had already trashed the movie. After nearly 2-1/2 hrs, the film had ended but I was still sitting, dazed, in the cinema hall rather than getting up to leave the theatre. Even the Salman Khan fan sitting on my left seemed stupedified to speak. Veer [Salman], the Pindari, who was uniting princely states to revolt against the imperialist British, had been killed soon after winning over his beloved, princess Yashodhara, from the swayamvara, and conquering her state. Yashodhara's treacherous father [Jackie Shroff] who had sided with the British had been killed. It had taken two hours for the story to reach this stage and for the audience to get a grasp of the situation when suddenly Veer is dead, leaving the movie-goers lost and confused. Just when the lights are on, probably to conclude on a happy-ending note and ensure that audience don't return depressed--Veer's young son appears. This young Pindari reaches the palace, riding a motorcycle while his grandparents and widowed middle-aged mother [Zarine Khan] looks on from a distance, even as credits roll on. Handling a period film is not an easy thing. But Anil Sharma, who is best remembered for his jingoistic Gadar simply failed to pull it off with Veer. Given the historic background of Pindaris, who were demonised by British, it could have become a fascinating tale. But Sharma relied too much on Salman's rage, emotions and histrionics. The Pindari holds and folds the swords, raises horse on his hands and stops the spear with his palm. But despite the actor's fierce persona and energy, the hero and his mission appear unconvincing. Mithun Chakravarty, who plays Veer's father, and his band of fighters are shown more like the poor depiction of tribals in the movies of late 70s and 80s. Veer is sent to England to study and falls in love with the daughter of the Raja, whose hand was severed in the battle with Pindaris. Victorian English culture and Indian rural [or tribal] tradition keep appearing one after the other. English tunes give way to Hindustani and then to Rajasthani folk, keeping you perplexed. The songs are mediocre though the camerawork and opulence carry the move to an extent. The basic problem is that the movie fails to engage. Though I had read Chetan Bhagat's book, still, Amir Khan's Three Idiots had kept me glued to the screen. Perhaps, another director with more historical research and passion for the subject rather than star's machismo, may have handled it better and come out with a wonderful movie. But I must confess, it's admirable the way die-hard Salman fans even found enough to cheer themselves up in this movie. The guys who exulted in Veer's dialogue, 'jahan haath marunga, paanch ser gosht nikal lunga'. And more over for those who watched the flick and remark, 'Bhai ne kya body banayi hai'. It was essentially a movie for these Sallu fans. I had no great expectations and so I can't say that I was disappointed. It was just another typical Bollywood movie with a concoction of songs, stunts and some sort of story. Now it's over to the third Khan. Though not a movie-buff, I now intend to watch Shahrukh's My Name is Khan, also. After the Mughal empire weakened, the Pindaris had emerged as a major headache for British. One recalls Amir Khan who was among the most prominent Pindari leaders and commanded a strong army of over 18,000 warriors, had been defamed as Amir Ali thug. Amir Khan fought along side Holkars and Scindias. However, the East India Company offered him the former Tonk 'state' that was in the form of separate jagirs spread in disjointed form and situated hundreds of kilometres from each other, in Rajasthan and Madhya Pradesh, to keep him occupied with its troubles. He was offered Olive branch and termed Nawab. Cruelty, manipulation and statesmanship was used to deal with Pindaris in different parts of Central india. Colonel Sleeman is hailed by the British for taming the 'barbaric' Pindaris and the thugs. Karim Khan, Namdar Khan and Wasil Mohammad--the main Pindari leaders eventually surrendered while Cheetu died in the forests. A strong army comprising over 1 lakh soldiers hunted the Pindaris and exterminated them by 1818. There was the legendary Sheikh Dullah, who disappeared and became a mysterious personality, dubbed as a bandit at times. In Central India he is recalled in folk tradition. The 'thugee cult' that included both Muslims and Hindus, specially the latter being devotees of Kali, were termed as ruthless killers. In his book, Martine van Woerkens suggests that it was exaggerated and perhaps a result of fear of British. It is also termed as manifestation of the misunderstanding of the British towards Indian religious and local practices and an attempt to paint natives as barbarians. Read a study on the Pindaris as part of a research work in a US university. A large number of Hindu saints, sadhus and mahants are expressing solidarity with Ahsan Khan, who has been on a fast unto death demanding institution of a judicial probe into the Batla House encounter case. Khan, whose condition is now critical, on the 25th day of his fast, has got support from all cross-sections of society. Religious figures of both the communities, Hindu and Muslim leaders, intellectuals and writers have expressed their solidarity with him. Strangely, it seems that such news get lost somewhere on way from Azamgarh to Delhi. It fails to reach even Lucknow. Khan has been urging UPA government to institute a judicial inquiry, which is a genuine demand in case of any encounter death. Further, the point that when personalities ranging from Maulana Imran Falahi to Mahant Baba Somnath visit him, pledging their support for his cause, should such a news be blacked out? Meetings are being organised and residents cutting across social strata are voicing concern over his deteriorating health, as also about the apathy of the Centre towards the agitation in Azamgarh. If there is Arabic Teachers' Association's Abdul Qadir who is speaking for Ahsan Khan, there is also Bar Council's head Rajendra Prasad who held a meeting for the cause. Social activist Krishna Kumar Pandey is also holding programmes just like Maulana Muzaffar Islahi. It again proves our pluralstic culture. When Azamgarh was termed Aatank-garh and four million Azamgarhis [80% of them Hindus] were demonised, then also the town had seethed with anger. Both Hindus and Muslims were equally pained as just because of suspicion of terrorist links on a few youths, a historical town and the entire district was defamed. Did Delhi notice it then? 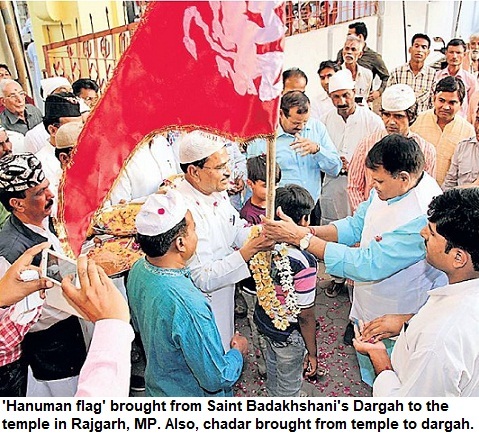 When there is a man undergoing 'aamran-anshan', Hindu and Muslim religious leaders approach him. Once again Delhi will either ignore it or won't bother to see it. It doesn't fetch TRPs, perhaps. It is not necessary that all of them consider the encounter at Jamia Nagar in Delhi as fake. However, as citizens of a democratic nation, they are concerned that demand for a probe shouldn't be pushed under the carpet by the Congress-led government, as it leaves a lot of doubts and also puts a question mark on the credibility of a state. Who hasn't heard of Mushairas in the sub-continent? But what about Tarahi mushairas! While Mushaira is an event where poets recite their compositions in front of a large audience, and the rendition continues for hours even after midnight, Tarahi mushairas are slightly different. They are mostly for the real wordsmiths and aficionados of poetry, and are still held in most parts of the country. They don't get publicised because they are for the most passionate poetry lovers. While success in mushaira depends on several factors including the style of rendition also, Tarahi mushaira tests the rhymster's real talent and his ability to churn out asha'ar and ghazals. Ahead of the Tar'hi mushaira, the poets are given a 'misra' [a line of a couplet] and they have to compose the ghazals in accordance with the 'qafia' and 'radif'. For example a recent Tarahi mushaira that was held in Muzaffar Nagar in Uttar Pradesh (UP) where the poets had been given the follow misra-e-tarah: Jab voh milaa to chashm-e-basirat chali gayee. Nearly twenty-odd poets attended the mushaira and recited their ghazals [each having five or six couplets with one of them having this misra and the rest having the similar ending]. Of course, the couplets have to be in meter and it shouldn't be mere tukbandi. *Canaan: The place mentioned in Hebrew Bible also where Yusuf AS [Joseph] was thrown into a well by his brothers. While the institution of Mushairas is as strong as it was in the past and in certain respects more colourful, attracting large audience, there is a feeling that serious poets often stay away from the public mushairas. However, in Tarahi mushairas, the emphasis is still on nuances of poetry, language and depth of expression. They are not too popular but the 'nashists' [sittings] are held almost in every city or town that has substantial population of Urdu speakers.